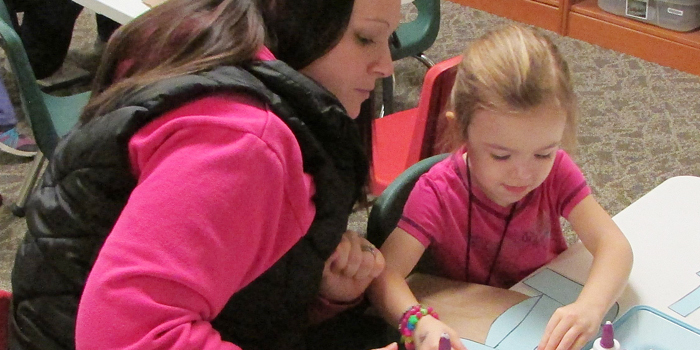 Kristen Riley helps her daughter Braylee put together an elephant and piggy craft during story time March 13. MILFORD — The following is a list of upcoming activities at the Milford Public Library. Adults 18 and older can win prizes just by reading and filling out a bingo sheet! For each row on the bingo sheet, a participant can enter their name into a weekly drawing for a prize and if you fill out the whole sheet your name gets entered into win the grand prize. No library card needed! Just sign up at the adult circulation desk. The Adult Reading Program will continue until March 30, so hurry in and fill out a bingo card to win prizes for reading. This is the last drawing before the big end drawing. This is also the last Friday to get the free leprechaun treat available for anyone in Adult Reading Club. Lapsit continues with Miss Tiffany on Tuesday, April 2 with sessions at 11 a.m. This spring’s theme is “Mice are Nice.” Lapsit is a program for children under three years old. Lapsit introduces children to literature with interactive fingerplays, music, and stories. Lapsit lasts about 20 minutes. No library card is needed. Please register by coming to the children’s department desk or by calling 658-4312. Story Time sessions for children ages 3 to 6 years old returns on April 3. Story Time prepares children for preschool and enables them to develop interpersonal, language, and literacy skills. Children will create crafts, listen to stories and enjoy a snack! Spring sessions begin Wednesday, April 3at 10:15 a.m. and 1:30 p.m. and Thursday, 4 at 7 p.m. Themes include Fairy Tales, The Very Hungry Caterpillar, Raindrops Keep Falling on my Head, Spring Chickens, Down on the Farm, and Mother’s Day Tea. No library card is needed. Please sign up at the children’s circulation desk now.